Magic Amps Vibro Prince is a great, may we say Princeton circuit done and voiced to perfection. Along with some cool options for speaker configuration. 1x10, 1x12 and 2x10 which we also have in along with Magics tweeds . These amps have that classic vintage Princeton tone. To die for American cleans and great classic Fender Blackface break up when pushed. The 1x12 a bit more headroom along with a little different personality that you would expect from going to a 12 inch speaker rather than the 10''.. lil less top end sizzle when turned up load and a bit warmer and smoother with dirt pedals. It has a lovely warm tone with great top sparkle you expect from an amp like this. Michael Moody really has these amps fine tuned and dialed in. 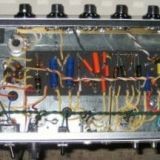 “The Vibro Prince is a near perfect replica of a 1967 Princeton Reverb modeled after my daughter's original 67 PR. 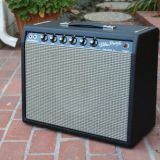 The late Blackface and very early drip edge Silverface Princeton Reverbs were my favorite of the Princeton models. They seem to have a ballsier sound than the earlier versions. The speaker choices were also better including my favorite; the Jensen C10N. The Vibro Prince is equipped with: voltage correct Mercury Magnetics and Magnetic Components transformers, proprietary Weber/Magic C10N, Sozo Blue Molded capacitors, Sprague Atom electrolytic capacitors, CE Distmulti-section cap can, Allen Bradley Carbon Composition resistors (used where it counts), correct color-coded cloth covered wire, proprietary replica chassis, period correct reverb cables that look and sound exactly like the originals, full sized reverb pan.